We've also included a feature to help save you from performing any unnecessary cloning - the list of "Associated Plasmids" from these citing articles. What's this? Simply put, if the authors of a "Citing Article" have deposited plasmids associated with this "Citing Article" - such as cloning their gene of interest into a previously deposited vector - then you'll find the plasmids listed below the citation. An example of these "Associated Plasmids" is shown in the purple box below, where the bulleted list of plasmids is associated with the "Barcoding cells using cell-surface programmable DNA-binding domains" publication. 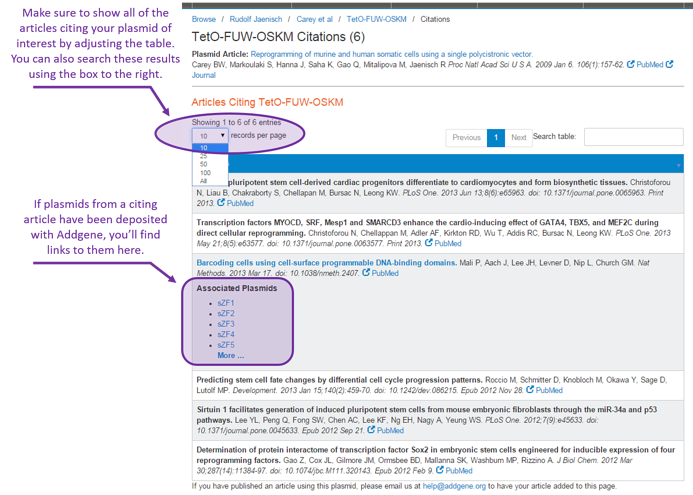 If you want to see this new feature in action, click here to explore the TetO-FUW-OKSM plasmid page. Or search for your favorite plasmids and see where they've been cited. We are still growing our "Articles Citing This Plasmid" database - and we always appreciate any help we can get. 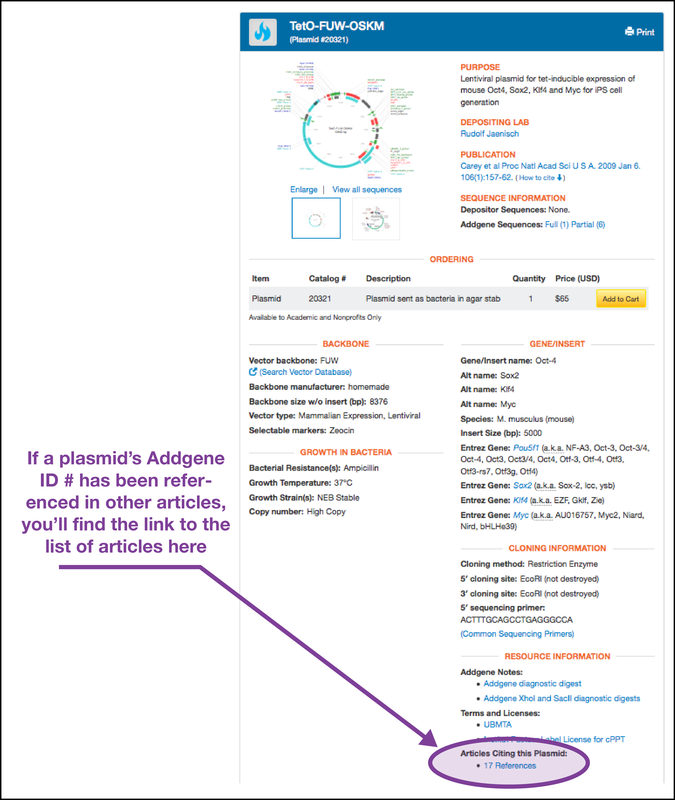 If you know of an article that used a plasmid from Addgene, we want to hear about it so we can link to it in the "Articles Citing This Plasmid" list. Email us at help@addgene.org with the Plasmid Name, Addgene Plasmid ID #, and the PubMed ID # (PMID) for the article that has used this plasmid. Happy researching! If you need any assistance finding plasmids on Addgene's website or would like to contribute plasmids you have made to the repository, email us and we'd be happy to help.